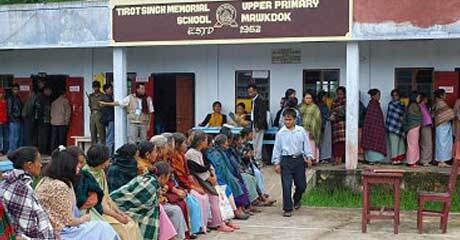 SHILLONG: Chosen for its “extreme weather” for holding mock polls among five locations in the country, Sohra on Tuesday witnessed heavy turnout in the polling conducted to check the efficiency and accuracy of the electronic voting machines (EVMs). The new EVM with added peripherals — a closed printer and an open printer — attached to it was experimented to remove apprehensions about manipulation of votes during elections. In 36 polling stations of Sohra and Shella, the turnout was much above than satisfactory as villagers of the area along with others from the state capital and even from outside the state participated in the mock poll exercise. The average turnout was 75.16 per cent out of the total 20,161 registered voters in both the constituencies. The SDO (Civil) of Sohra Sub Division, James Suchiang, acknowledged the turnout as very positive participation. The East Khasi Hills district administration arranged additional transport means like Sumos to ferry poll personnel as well as voters within the sub division. Altogether 144 polling personnel were engaged in the mock polls held in 36 polling stations. Besides, 10 zonal magistrates, 18 sector officers and 145 police personnel including two gazette officers were part of the process which was carried out in a manner that successfully recreated a real poll situation. Sohra was chosen by the Election Commission of India (ECI) as one of the five places in the country for holding the mock polls on the recommendation of an expert committee following complaints by the political parties challenging the accuracy of the EVMs. The counting of the mock poll will start at 8 am on Wednesday. The counting is likely to take some time since the process is very new, the SDO said. “I came to see the whole thing as I want to learn more and assure myself that this process is genuine,” an elderly woman told reporters after casting her “vote”.